Contrary to popular belief, not all marble flooring and countertops are installed as single, glossy slabs. There are many design possibilities available. At Macadam, we carry marbles from a variety of vendors, including Dal Tile, Emser, Pental, Tierra Sol, and United Tile. Marble is one of the most enduringly beautiful choices in building materials, whether for countertops or flooring. The unique nature of each stone offers a one-of-a-kind look. It doesn’t collect dander, and is heat- and moisture-resistant as well, making it an excellent choice for many rooms in your home. Contact Macadam Floor and Design to discuss the possibilities. Few flooring types exude prosperity the way marble does. Although considered a high-end flooring choice, it’s surprisingly affordable. Marble flooring is an especially attractive choice for high-traffic areas like living rooms. It is also great for rooms in which moisture is a concern, like kitchens and baths. It retains temperature well, keeping it cooler in summer and warm in winter when installed with proper insulation. It’s scratch-resistant, making it an excellent choice for homes with pets and small children. Unlike carpet or other porous surfaces, it does not collect dust, dandruff, or other allergens. Once installed, it will bring lasting value and beauty to your home. When choosing countertops for your home, beauty and ease of care are the top considerations. Marble not only enhances many room designs, but is also beautiful, durable, and requires little maintenance. 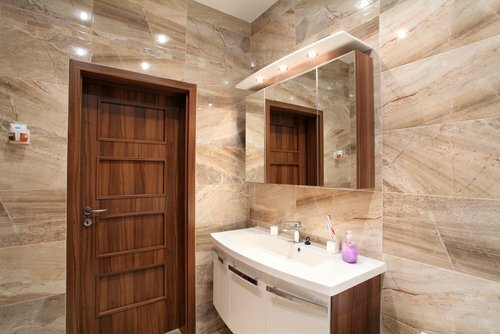 As a softer stone than some countertop choices, marble is best suited for offices, bedrooms, and bathrooms. Imagine a cabinet with an elegant marble top for the office, or a bathroom with a marble countertop. The heat resistance of the stone makes it resistant to marring from hot hair styling tools, and regular sealing keeps the surface stain- and scratch-resistant. At Macadam, we have a deep understanding of the materials we use. We work with top professionals who are prepared to work with you to ensure your satisfaction. Read our Mission Statement to learn more about Macadam’s dedication to quality.